Hotel Gabbiano is in a favourable central position in the Isola Rossa village and only at 50 meters distance from the sea. Isola Rossa is a tourist locality which belongs to the town of Trinità d'Agultu, Sassari province, in the famous northern coast of Sardinia. The name of the village means "Red Island" and comes from the little island offshore the village with same name, made of a pink colour granite rock. 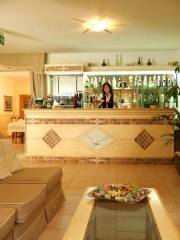 Hotel Gabbiano is a three star family managed tourist Hotel where it is possible to spend a relaxing vacation and enjoy Isola Rossa seaside, beaches and tourist attractions. The Hotel in a two storey building is well integrated in the village. The position of the hotel makes possible the access to many activities in Isola Rossa, The Hotel management can give directions to tourists for services available locally: boat rental with or without crew, beach services, swimming lessons, guided excursions. Other services and sport facilities may be available locally, you could enquiry within the Hotel. The Hotel offers 17 rooms equipped with double bed or two single beds, private bathroom with shower, direct dial telephone, desk, colour TV and air conditioning. Hotel Gabbiano can be easily reached from Alghero Fertilia 96 Km, Porto Torres 60 Km, Santa Teresa di Gallura 45 Km, Olbia 77 Km. The Hotel management will be able to give information on the public transports available to reach the Hotel if you are not traveling with your car.